← Another Milestone, Reader Acknowledgement. Applied physicist and Harvard PhD, Dr Ronald M Powell, has authored a very useful document showing the harmful effects of electromagnetic radiation in the context of Smart Meters. 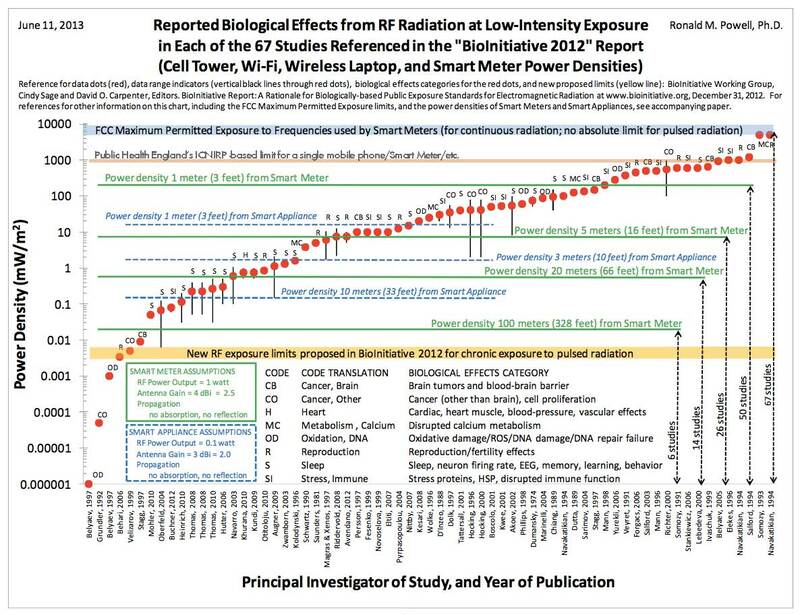 (2) New biologically based RF exposure limits proposed in the BioInitiative 2012 Report are 1 million times lower than current FCC limits and would protect against the biological effects found in nearly all of the 67 studies. (3) A single Smart Meter on a home can produce RF exposure levels that caused the biological effects found in either most or many of the 67 studies, depending on the distance from the Smart Meter. (4) A single Smart Appliance in the home can produce RF exposure levels that caused the biological effects found in nearly half or fewer of the 67 studies, depending on the distance from the Smart Appliance. Multiple Smart Appliances in a home multiply the total exposure. (5) A single Smart Meter on a nearest neighbor’s home can produce RF exposure levels that caused the biological effects found in many of the 67 studies. A given home may have one to eight nearest neighbors, each with a Smart Meter, multiplying the total exposure in the given home. (1) Most biological effects of RF exposure cannot be sensed by human beings. Examples are the onset of cancer, DNA damage, and fertility effects. One category of effects that can often be sensed includes neurological effects on sleep, memory, learning and behavior. (2) Unborn and very young children may be more affected by RF exposure than adults. This document provides background information, an explanation of each feature of the Biological Effects Chart, and a detailed discussion of each of the conclusions and observations summarized above. This entry was posted in AGENDA 21, ENVIRONMENT, HEALTH, radiation and tagged Electromagnetic field, Electromagnetic radiation, Federal Communications Commission, Harvard University, Public health, Smart Appliance, Smart meter, united states. Bookmark the permalink.